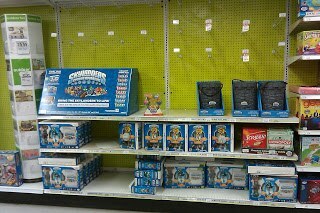 Well, as folks have been clammoring to Activsion and Toys for Bob telling them, "There are no Skylanders!" only to get the ubiquitous response, "They are coming soon!" I thought I would substantiate that claim. Yep, have fun with your Starter Pack...that's all you get! Unless you feel like coughing up $40 or so for the over-priced and bulky "castle tote." The $20 soft-side cases were all gone for what it is worth, lol. And note that the Starter Packs are even low on stock! 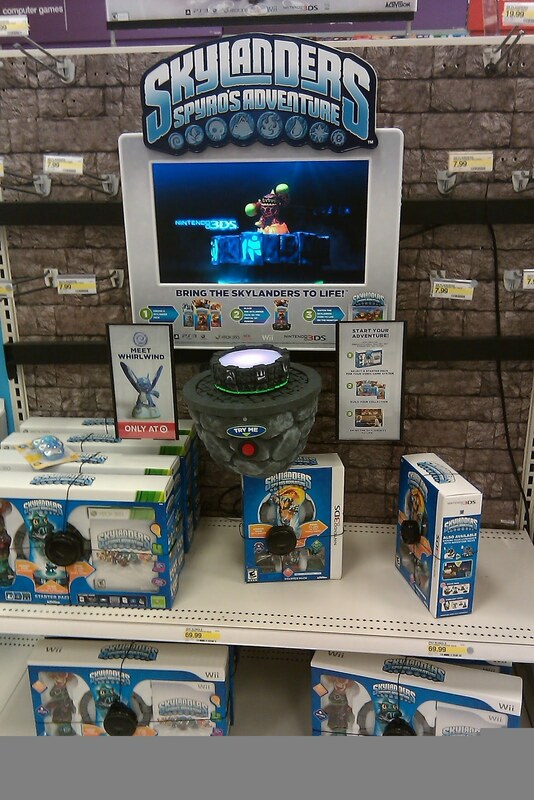 Following this up I ran to a smaller store that carries Skylanders. They had 3 mini-racks full...and they were all Boomer. I referenced this in the poll results last night, but locally Voodood was the one that was always left behind. Now it seems Voodood is even out and there are just a few Boomers here and there (I think both are good characters btw). 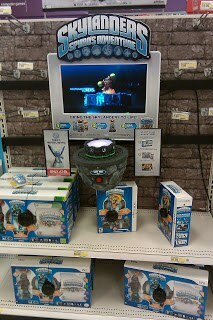 I will mention that Toys'R'Us had stock in their main section, but it was very picked over. For the first time in a long time I only saw 1 or 2 Dark Light Crypts. There were no Pirate Seas Adventure Packs and outside of Boomer, the rest was held to recent releases (Zap, Stealth Elf, Wrecking Ball, Hex, Dino-Rang, etc). I didn't snap a picture because there were 4-5 kids in front of me at all times, lol. I have to say I'm glad I got the game when I did...Legendary Triple Packs were stacked deep on 4 racks at one point. Whirlwind was once pretty common at my Target...I did have a hard time finding Drill Sergeant, in part to the screwy way Wal-Mart deems their stores "large" and "small" market...plus I just generally try to avoid that place. I have been fortunate enough to snag the new Skylanders almost as soon as they were released (Hex, Dino-Rang, Wrecking Ball etc). And amazingly, they were about the only ones left this week. As most of you know, the next wave is "supposed" to hit Monday, January 16th, 2012. I have noticed in the past that when other folks were telling me they just got "Hex" or "Dino-Rang is in stock" etc...there was about a week to 10 day delay until I saw any at my local stores...and I was making regular checks. So, it is very possible (assuming they relase on schedule) that I won't have Double Trouble until later on in the month. Rest assured, I will pick Double Trouble and the Empire of Ice up ASAP! I am most excited about Slam Bam and the Empire of Ice personally...even including later releases. I am pretty ticked that activision would release Double Trouble in a triple pack with what were to be EXCLUSIVE characters, namely Drill Sergeant and Whirlwind. I've gotten a lot of feedback on this and it is just a bad pr move on Activision's part. It isn't too hard to find a Target or Wal-Mart here in the US and if you have to have them and come up empty find a friend or relative that can look. The prices some people have given for them is insane! I am sure the person who coughed up $150 online for Whirlwind will kill over when she is in a triple pack with a new character AND Drill Sergeant for $19.99. On that note, I also saw Double Trouble, Cynder, and the Empire of Ice on sale via Amazon....for crazy money. DO NOT rush out and buy them...in addition to the fact that you prob won't get them any sooner than if you waited, they are a rip off. Single Packs should be $8 US and Triple Packs/Adventure Packs are $20...Don't pay more than that unless your situation requires it. I hope to check stock for the new characters as close to the 16th as possible, and then when I run errands. I will pick up Empire of Ice and Double Trouble if he is in a single pack. I might wait on Cynder...it would be incredibly stupid for Activision to drag out Camo until June, but the way things are going and the responses I got from their tech dept. I would have to say that would be typical. This is a great game, it has the one huge glitch, but the way they have chosen to (or even mismanaged things) just plays into the skeptic hand that it was a huge money grab. June shouldn't be when you get the last character to round out a game from October...it should be when we see screen shots for Skylanders II....that had better utilize the same character line-up! Anyway, enough on that for now...I know many of you were asking me about stock here, or if I could pick up a character for you etc...this pretty well takes care of that, lol. 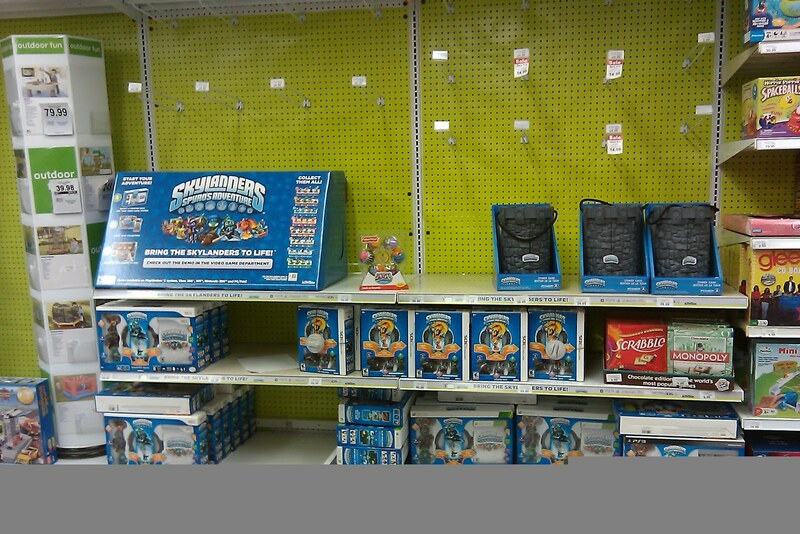 I would advise anyone reading this and looking for a certain Skylander to monitor the stock carefully this week and try to catch the new characters and hopefully a re-stocking off the older releases you might be after. Good luck! Chime in here, Twitter, Facebook, or post up a comment when you snag the new releases...we'll see if we can establish a patter (east to west, west to east, etc). Anyone you know selling these online, I have no access to a car and cant find these without paying ripoff pages. Nope, my best advice is to just frequently check gamestop.com...I have yet to see Cynder or Empire of Ice in person locally. Gamestop charges shipping, but in all honesty I have burned more money on gas than that just looking one night a week, lol. Good luck! Thanks for the post, I ordered a few hours ago, lol. I think it should be stocked DEEP at every TRU given the 30 day window, but who knows...I figured it was a solid chance.